Thanksgiving is my favourite holiday. Part of it is the changing season and the beautiful autumn colours. Instead of being about consumerism, like virtually every other holiday, Thanksgiving is about gratitude and family. Gratitude is something I write about a lot, because approaching life with an attitude of gratefulness is good for us – it’s good for our spirits, and it’s even better for our health. But family is hugely important to me. And when you think about finances as much as we do — and as much as you probably do too, if you’re reading this — it’s natural to want to find ways to overcome the social taboos around talking finances with family. We’ve managed to do it, and have gotten to a place with our relatives where we’re all pretty open with each other about money. That openness is the reason why we felt comfortable loaning money to another relative, and convinced the family to do a no-spend Christmas last year. We’re fortunate to be in a position to help folks in the family, but none of that would have been possible if we hadn’t found ways to break those ingrained taboos. 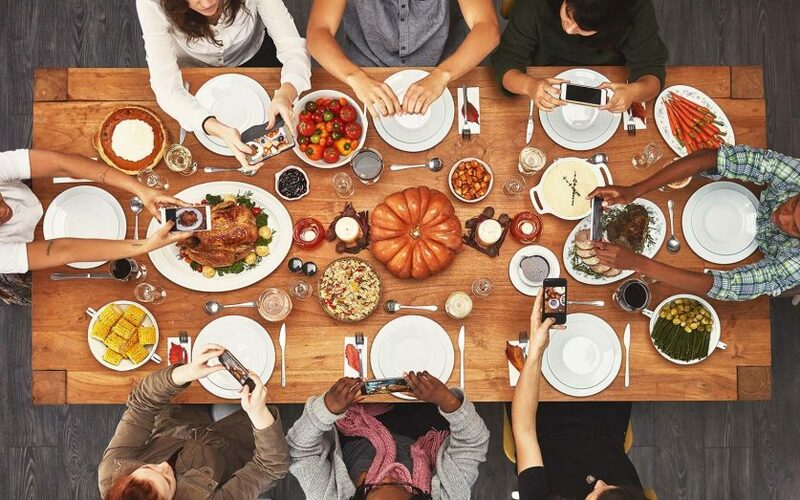 Thanksgiving is traditionally a time when families and friends gather. It’s a time to catch up on each other’s lives and celebrate being together. But it’s also a time when there’s a lot of emotions flying. There are going to be some touchy subjects around the table. The last thing you want to do is make money one of those touchy subjects. But given that money is both a major source of stress for many people, and potentially a hugely empowering force, it’s worth breaking down the barriers that stop us from talking about it, because we all have a lot to learn from each other. We’re sharing our tips for breaking those family and finance taboos about talking with family, without hurting feelings. Going into an emotionally-loaded gathering like Thanksgiving, it’s especially important to keep feelings in mind first and foremost. Even if you’re talking about finances outside of a family gathering, money is one of those subjects — like politics and religion — where our emotional sides tend to lead the way. So even if you have a whole slew of rational arguments ready to go, remember that it’s not your job to win a debate, it’s your job to be compassionate and loving. None of us wants to be told what to do. We want to be supported. So think about how you can best support your family when you open up the money subject. Think about the last time you encountered a know-it-all. Were you inclined to listen to that person, or did you want to roll your eyes and get away? Don’t be the know-it-all at the table, even if you do know a lot about financial principles. We call it personal finance for a reason: because it’s personal. What’s right for you may not be right for someone else, and vice versa. Go into your family gathering knowing that you don’t know everything, and that you certainly don’t know everything about others’ unique situations. Remember that you’ve probably had money struggles at different times, too. Rather than give advice, strive to share what has worked for you. And open the subject by going there on the money topics. When asked, “How have you been?” it’s a perfect time to respond, “You know, we’ve really made an effort to get our spending under control, and as a result we’ve saved more, and I can’t tell you how much happier we feel.” Putting it in terms of what you’ve done and how that makes you feel will make it much easier for people to ask questions, and that’s when the barriers start to fall. If you sense that you’re in a very different income situation than other family members, you don’t need to share actual numbers, but can still be open about the money principles that are working for you, and especially the positive feelings that you’re bringing into your life. When people start asking questions, that’s when you know you’re making progress. But resist the urge to give a lot of advice, and especially resist the urge to judge. Answer their questions openly and honestly, share the places where you’ve struggled, and keep that humility throughout. If they start asking for specific advice, point them to resources you’ve found helpful rather than offering to be their financial planner. And absolutely stay away from declarative statements like “You’ve got to get your debt under control,” or even, “You could retire early, too, if you stopped spending so much.” Any statement that triggers a defensive feeling will make a person less likely to talk to you about money in the future. In addition to sharing how your money choices have improved how you feel, putting things in non-financial terms can help a lot, too. I’m convinced that people love talking about decluttering and minimalism because they let us talk about spending decisions without directly talking about money. Instead of talking about your investing strategy or coming across as sanctimonious about your frugality, perhaps talk about how you’ve made a big effort to figure out what truly adds value to your life, and to stop buying things that only add clutter. Or how you’ve realized that you can cut years off your working life by giving up just a few things like eating out and shopping for trendy clothes. It’s unlikely that you’ll go from never talking about money to total family openness overnight. It can take years to get there as a family, with every year bringing a few more inches of progress. Our family would have gotten to the no-spend Christmas if we’d proposed it 10 years ago, but when we suggested it last year, after having had years of sharing our early retirement plans and supporting others through their money decisions, everyone was open to it. The flip side of being open about money is that people may feel that they can come to you for actual financial help. Depending on your family dynamics, you may be okay with that, but if you’re not, make sure that you’re not sharing actual numbers, and that when you talk about being able to retire early, you emphasize the sacrifice that’s necessary to do so, and that you will be living frugally to make your money stretch the decades you need it to last. And if people do come to you for financial help, offer to link them to helpful resources rather than actually writing a cheque. Though we’ve been willing to help a few relatives out, we’ve made clear to them that we’re willing to help because the arrangements are also good investments for us. And with other relatives, we’ve offered to provide moral support but have made clear in the gentlest way possible that no money will change hands. Standing firm on this is important if you don’t want to be fielding requests for the rest of your life. There is a fine line in talking about finances in a family. Its great to be able to open up and offer support to our relatives, or accept it, but it has to come with defined boundaries. While the term money and blood don’t mix may have been a little exaggerated, it has a very clear message. Talking to family about finances doesn’t mean coming to their financial assistance. It is always wise to keep a healthy distance. That’s where being open and communicating about finances in a family can help develop those guidelines. Setting parameters is prudent in Keeping Life Current.